Scale model of Mavag/Fiat 'Mocher Wagen', 1923 with feet propulsion replacing conventional rear wheels. The author saw at Rétromobile in the 80s at Paris a movie of a similar French walking machine, but without front wheels, scale 1. No more is known. Pict from the review 'Wheels and Tracks' N° 61 about 1998. Watermaster Amphibious, 1995, is a multipurpose (suction, dredging, pile driving) floating dredge which can move in water, walk in and out water without any assistance with its 'legs'. It is also fitted with anchors. Manufacturer is Aquamec Ltd, Sâkylä, Finland http://www.watermaster.fi/technology-mobility.html Lower left pict is from : ABS-CBN Cotabato and Rolly Roque, ABS-CBN News : http://pinoyjourn. Straddle tractor in agriculture, 2000. Pict from review 'Ca m'intéresse', 2001. Kobelco tracked crane, 2006, with walking excavator like stabilizers. Pict J M M at Intermat, Villepinte, 2006 04. Hinowa Crane with stabilizers. Like walking excavators, these tracked tractors can stand on flat ground or slopes but without moving. 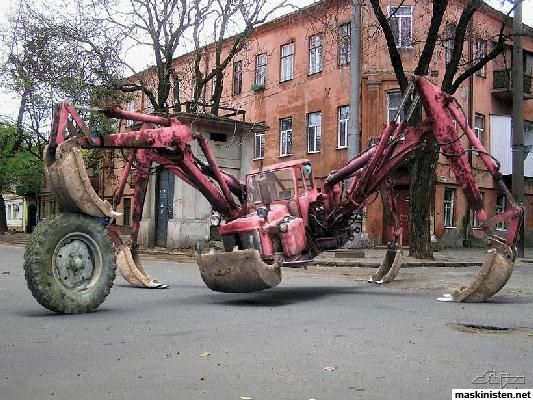 They can take ideas to a true vehicle for slopes, like walking excavators ? Robot TitanXI of Shigeo Hirose looks like that. Pict J M M at Intermat, Villepinte, 2006 04. LeTourneau Tree Stomper of 1964 was a walking vehicle of the same principle of walking draglines. It was used for land clearing job in Dare Country, North Carolina. 120 t, 475 hp Detroit Diesel. Tree Stomper sits today at the same place. Upper pict from the book 'R.G. LeTourneau Heavy Equipment' by Eric Orleman, Iconografix, 2008. Lower pict. From book ‘The LeTourneau Legend’ by Philip G. Gowenlock, Paddington Publications Pty. Ltd, 1996. US003366192-001 LeTourneau Tree Stomper Walking vehicle patent, 1964. Wheel-leg vehicle as Whegs robots of Case Western Reserve University, built with Meccano/ Erector by J M M, 2009 06. Trojan Horse 8x8 hybrid robot. ASV Adaptive Suspension Vehicle, Walking Machine, 1984, from Ohio State University. Mass 2600 kg, ground clearance 1,4 m, length 5 m, The vehicle can cross ditch 1,8 m wide, climb step 1,7 m up and down, max slope 60%. Pict of J.R. Fitzsimons, Ohio State University, from review 'Science et Vie', Feb 1986. Metriqc walking machine, 2001, of Ecole de Technologie Supérieure du Quebec, University at Rimouski.